Visa is our biggest holding in New York and has done incredibly well. 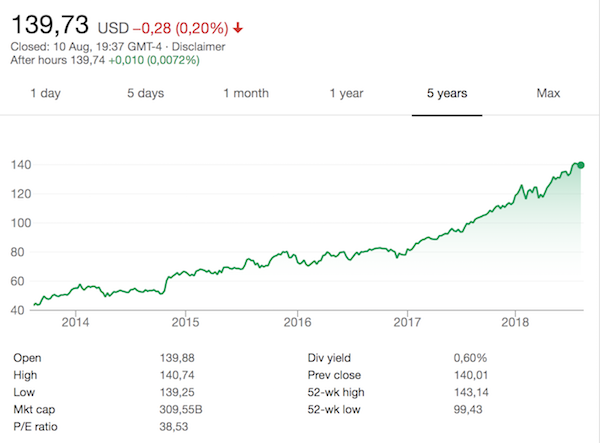 In 5 years the share price is up 212%. But this does not mean we must become complacent and expect it to continue to thrive. The competition for electronic payments is heating up, and many merchants are tired of absorbing swipe fees. This Bloomberg article titled Behind the $90 Billion Brawl Over Credit Card Swipes does a good point form explanation of the industry. To summarise, here are the current pros and cons for Visa. The pushback is coming from the merchants. They are saying that the fees associated with these transactions are being pushed onto consumers unequally. The wealthy are benefiting from loyalty rewards which are being subsidised by fees paid by people with less money. A company like Kroger who are partially banning Visa cards should be careful what they wish for. I for one would be very irritated if my credit card got rejected at the till because it was Visa. Debit cards pay a flat fee while credit cards pay a percentage. Visa and co. prefer the percentage model. Merchants are trying to change this. There is a lot of competition in this area, but it seems like the competition is taking on the banks, not the switch providers like Visa. Alternatives like Apple Pay, Stripe and Square all use Visa and Mastercard's switching services. To conclude, an industry that makes a lot of money will always face regulatory push back. And it makes sense for the merchants to state their cause. But as I have mentioned, the merchants are far more reliant on the switching companies than they would like to admit. There is no alternative. The war on cash is still in it's infancy, we still see much more room for this area to grow. Despite a few regulatory hurdles, Visa will do just fine. In fact, most regulatory changes will go against cash and in favour of companies like Visa. We are watching these trends closely but we remain bullish on Visa.